Raspberry Pi has released its latest programmable computer, the newest one on the block is Raspberry Pi Zero and it costs just $5. That is right for $5, you can have a computer that can be programmed to do lot of things. Raspberry Pi says the Pi Zero is 40% faster than the original Pi 1. Raspberry Pi says that the Pi model B and its successors put a programmable computer within reach of anyone with $20-35 to spend, and millions of people have used Pi. But still that price tag is also expensive for some people and they worked from the past year to bring the cost down and released the Pi Zero. 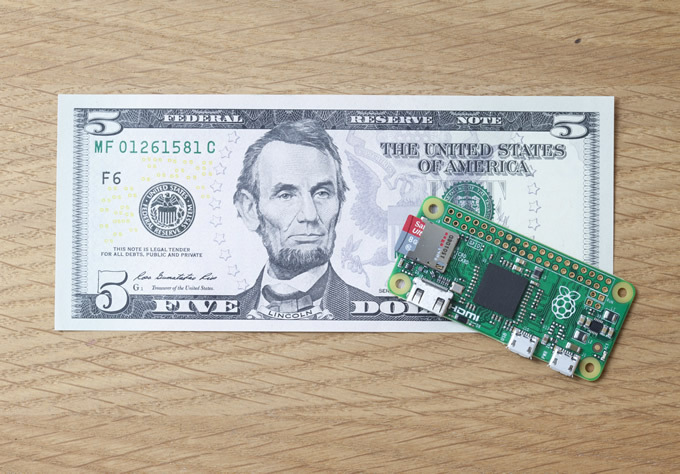 The Pi Zero with its price tag will attract more enthusiasts to the Pi project. The Raspberry Pi says that Pi Zero is a full-fledged member of the Raspberry Pi family. Here are the specifications of the Raspberry Pi Zero. The Raspberry Pi Zero runs all favorite apps including Scratch, Minecraft and Sonic Pi. It is available from today in the UK from The Pi Hut and Pimoroni, and in the US from Adafruit and Micro Center stores. It is also available free with The MagPi magazine December issue in UK.